Traveller is the first and greatest of the Science Fiction settings for Roleplaying Games. It projects a future history across millennia and thousands upon thousands of systems and worlds, involving true heroes and villains, hundreds of sophonts—both major and minor, and deep, interesting secrets. Originally published in 1977, Traveller has passed through five editions and multiple rule systems, from Traveller and MegaTraveller to GURPS and the d20 System and back again to Traveller. The background is huge and has developed over the course of its forty year publishing history. Yet in that forty year history, what Traveller has never really had its fiction, certainly not in comparison to RPGs of its era, such as Dungeons & Dragons, Tékumel: Empire of the Petal Throne, and even RuneQuest. All that changes with the first novel from Marc Miller, the creator of Traveller. 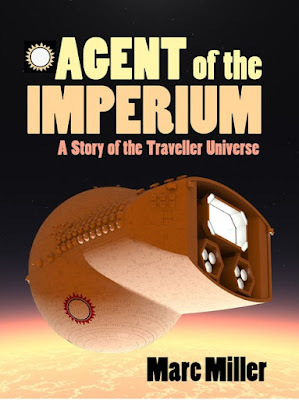 Published following a successful Kickstarter campaign, Agent of the Imperium: A Story of the Traveller Universe explores the setting from a unique point of view—a chipped personality who can appear again and again over the course of the centuries, roughly in the middle years of the Third Imperium. This personality is Jonathan Bland, an Agent of the Imperial Quarantine Agency, the department of the Imperial Navy dedicated to dealing with alien and outré threats.Viruses, diseases, intelligent robots, psionic outbreaks, and other threats, many of which originate from long in the Third Imperium’s prehistory. One of these chips—or wafers—is carried aboard every ship of the Imperial Navy and Imperial Interstellar Scout Service and is activated under certain circumstances. Once activated, the Quarantine Agent has the mandate the Emperor and acts with ultimate sanction to deal with any threat, which may see a world being interdicted as a Red Zone or it may see a world being systematically ‘scrubbed’ of life and all features. So Bland—surely a nod to the bureaucratic anonymity of both the role and the character—appears over the course of centuries taking decisions that no one other than the Emperor has the authority to take. Interestingly this deals with a couple of issues intrinsic to the Traveller setting, both technological in nature. The first is the lack of advanced electronics and of cybernetics/cyberware. This is due in part to Traveller having originally appeared in 1977 in the pre-Cyberpunk outbreak that came with publication of William Gibson’s Neuromancer in 1984 and in its computer technology always having lagged in the 1960s in terms of size and technology. It is also due to the Science Fiction of Traveller being inspired by the Future Histories of writers such as Poul Anderson*, Isaac Asimov, Andre Norton, H. Beam Piper, EC Tubb et al of the 1950s. The use of wafers in Agent of the Imperium points to the use of skill chips and personality chips in the Traveller universe as much as it serves as the narrative device for the novel, but it never gets away from the negative effects and the limitations of the technology. It is not an embrace of cyberware or indeed, thankfully, of the Cyberpunk ethos, but it does point towards the use of more advanced technology than in Classic Traveller. *Poul Anderson in particular as Jonathan Bland is cut from the same cloth as Nicholas van Rijn and Dominic Flandry, even if that cloth is bureaucratic grey. The second is born of Traveller’s inspiration, that is, the Roman Empire. The issue in both the Roman Empire and the Third Imperium—and beyond is the technological limits upon the speed of communication across vast distances. In the Roman Empire communication speed was limited to that of horse on land and sail at sea, but in the Third Imperium and beyond, the limitation is the lack of Faster-Than-Light communication combined with an interstellar travel time—whatever the distance, between one and six parsecs—of roughly one-hundred-and-sixty-eight hours, or one week. What this means is that communication time across the Third Imperium is measured in weeks and weeks, so the exchanging of messages can take months… Without immediate and direct recourse to the Emperor, an Agent such as Bland can be called upon at any time, for the direst of emergencies, because ultimate authority cannot be reached directly. So Bland is responsible for taking momentous decisions, which includes the ordering the death of billions if it necessary. Yet despite killing untold numbers, Bland is not an unsympathetic character. He never acts out of malice and the relatively minor acts of vengeance he takes are done to restore justice as much as they they to take revenge. Further his qualms come after the task is done when he has time to reflect upon his actions, but it is always the safety of the Empire that comes first. Not only that, the rules by which the Agent acts—Imperial Edict 97—allow him to act with kindness as much as he does with ruthlessness. So having set this all up, Miller has Bland begin to realise that there exist not only threats extrinsic to the Third Imperium—and in the long term, quite possibly to intelligent life across the galaxy—but also threats intrinsic to the Third Imperium. The plot sees Bland jump from wafer to wafer across vast interstellar distances and decades of time as the wafers are routinely synchronised and comes to identify internal threats, some of them at the highest level. Throughout Bland never wavers from being an ‘agent of stability’ even as he makes changes to ensure that stability. The final resolution of this problem feel ultimately bureaucratic, but then that is exactly what Bland is and so it feels in keeping with his modis operandi. For those uninitiated to Traveller as an RPG and a setting, explanation of the Third Imperium is provided, covering its history, its social structure, its world and ship categorisation, and major sophont races. Even so, this may well be still confusing or even overwhelming and some quick research online may be warranted if they are to get the fullest out of Agent of the Imperium. Traveller devotees will have no issue and there is no doubt that they will enjoy exploring a setting that they love from a fresh perspective and from the pen of its creator. For a first novel Agent of the Imperium is a great read and an excellent piece of Science Fiction that fits neatly into its somewhat older Future History sub-genre. Anyone unfamiliar with that sub-genre may find the setting of the novel old fashioned, even baroque in places. Traveller fans may also be disappointed that the novel only covers so many centuries and so many crises, since the setting has some major emergencies to deal with in its future, especially during the gaming periods for the RPGs in the second millennium. There is no doubt that it would be fascinating to see Jonathan Bland come to deal with some of those… Nevertheless, Agent of the Imperium: A Story of the Traveller Universe is a book that Traveller fans will thoroughly enjoy and definitely want a sequel to.